This is a reminder of who can meet the acceptance criteria to use invoice finance. There is a form of receivables funding to suit just about every type of business. So you will see that just about every sector is covered. In addition to standard invoice finance services which deal with the majority of the above sectors, there is specialist construction finance for funding against either invoices or applications for payment, and specialist retail finance which provides funding based on (and repaid via) your credit card receipts. Similarly, there are no limitation on the size of company that can qualify. 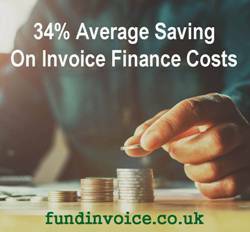 Selective invoice finance (where you choose invoices to have funded) normally comes with no minimums whatsoever, so even the smallest companies can use it. There are also funders that will look at the largest companies - the biggest we have looked at was a £250M turnover organisation. The industry figures show 418 businesses with factored turnover in excess of £100M per annum. If you want to see the type of funding that would suit your business, and to understand the costs please call Sean on 03330 113622 to discuss your requirements.